It has been a busy and difficult couple of months. I came down with a bad cold in early December, that turned into pink eye and then a sinus infection. And then, while I was vacationing with my family, I caught a stomach flu, which I just got over earlier this week, and now I have a cold again. All of this, of course, means that my recreational activities have been rather curtailed, including working on my upcoming (planned) web-comic. However, I did not stop entirely. I am still working on concepts for the web-comic,but I have changed the idea for the theme yet again. If you've read my past ideas, you'll note that this is the third concept I have come up with. Why have I been so fickle? Well, the #1 reason has been that my ideas have often been overly ambitious and this has led to stories that will be unworkable in terms of the DAZ resources and creating the art for the panels. I started with a thousand-year-plus old character, but found that the resources did not exist to do all the flashbacks and historical scenes I needed. I then shifted to an Asian-themed martial arts idea, which had some better support in DAZ. However, there still were not enough resources to pull off the idea that I had come up with, and I became frustrated by having to constantly compromise my creative vision because of the lack of 3D resources. Beyond that, as readers of this blog know, my biggest complaint about the comic industry of today is the over-use of grim, dark stories and heroes who regularly experience intense angst over their role in the world. Ever since, in 2012, I came back to reading comics, I have longed for a more classic Bronze Age style take on comics -- stories where the heroes are the good guys and the villains are the bad guys and the heroes don't constantly angst over whether they are making things better or worse. Such comics really don't exist anymore, and I miss them. So logically, I thought, why shouldn't I make a comic in this style, if I am going to do one? Therefore, I did some hard thinking over the holiday, while I was getting over my various illnesses. 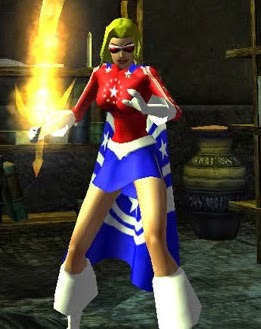 As I pondered what to do, one character kept coming back into my mind -- a character I created over a decade ago, in 2004, for the online role-playing game City of Heroes. This was a tanker character, with invulnerability and fire powers. I eventually leveled her to 43 before changing servers and leaving the character unfinished. I based her design on the many stars-and-stripes options that CoH had for their costume variants, and thus I made her a super-patriot of sorts. Here's how she looked back in 2005 or so, after getting her to around level 27. I loved everything about this character. I liked her powers. I adored her costume. Her personality was great, and consequently I enjoyed role-playing her more than my main character (a martial artist) or frankly any other character I have ever played since, in any role-playing game. Because I spent a long time role-playing her (about 2 years in CoH, and then reviving her again in Champions Online for a few months), I know this character very well. I get how she thinks. I know how she will react to various situations. And this means she should be very easy to write. Beyond that, she is a classic late Silver/Early Bronze Age style comic-book character. She is super-patriotic, but also has a code vs. killing, is a true-blue hero, loves fighting villains and protecting people, and never has any angst over her role as a hero. Thus, she seems the perfect character for a Bronze Age style web-comic written by yours truly. But as always, the question became -- can I make a workable version of this character in DAZ studio? And how much will doing so cost me? (DAZ resources, at least on the official website, always cost money.) If I could get the character close enough, then I might be able to pull off this idea. And so I began. The character (and yes, I know, I haven't told you her name yet -- and I won't reveal it for a while) is a teenage girl (16 in this case), so I chose the Teen Josie 6 model from DAZ studio as a base, and then I bought a few character models. I turns out I liked the body of one model (it was a little more athletic looking) and the face/skin of another, so I mixed and matched, which gave her a nice unique look. Then I bought a couple of clothing options, and used an old cape for an older figure that I had in my database, and after playing around for a while, I have come up with a reasonable approximation of that original character. Indeed, this character looks almost exactly like the original, except that her hair is braided instead of loose, and is slightly reddish rather than being gold-blonde. Now, why the difference in the hair? Well, the main reason is that most of the long, loose hair just does not work well with supeheroic poses, especially flying. The hair is designed to hang straight down the back, but when flying, it ends up looking stuck to the back of the neck, and therefore most of the hair models I have do not function well for flying. The braid, on the other hand, is posable enough that I can move it off her back and it looks like it is flying in the wind. This forced me to go with the braid. And that decision then affected the color, as there isn't a good gold-blonde version of the braid. There is a white-blonde version but it is too pale and honestly doesn't look very good. And so I made her hair more of a rose-blonde. Other than the hair, however, I am frankly amazed at how close I could get her outfit to the one she wore all those years ago in a video game. I had to do a lot of hand-editing of her outfit to get the stars and stripes into the right position, but even that wasn't so bad -- I did it in one evening, which was much faster than I expected. Now, I have a lot of work left to do before I can start producing a web comic (for one thing, I need to write the damn thing! ), and many more resources to buy. But I am very encouraged. This story seems to almost be writing itself, and the character model looks as good as I could have hoped. Stay tuned for more on the upcoming web-comic as I keep developing the concepts.